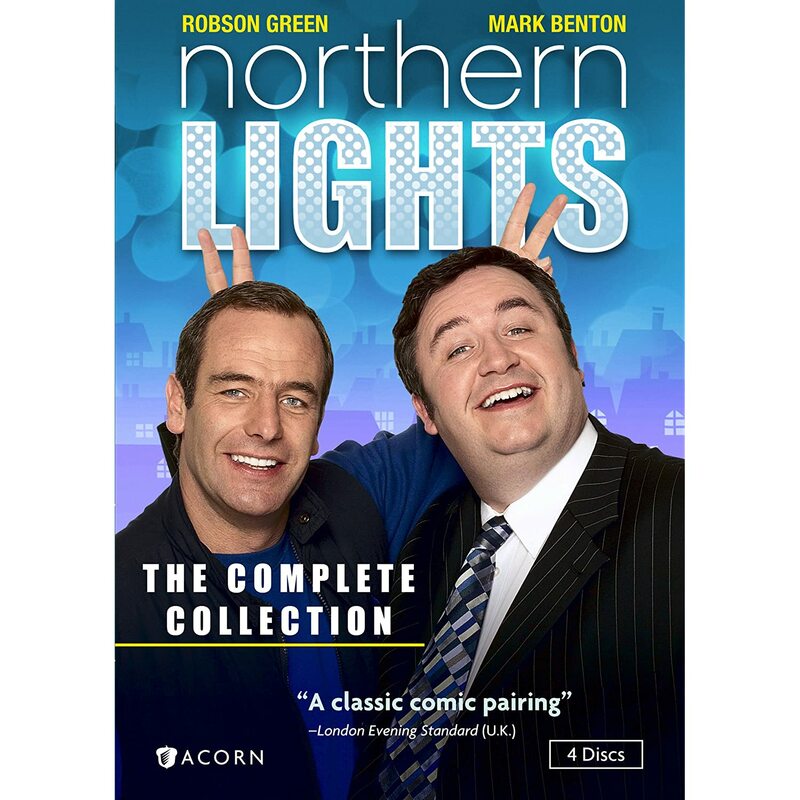 For fans of great British television, Northern Lights: The Complete Collection is a must. The show has had quite a history. A spin-off of the 2004 Christmas special titled Christmas Lights starring Robson Green and Mark Benton, they were such a hit with the public that ITV signed them up for the series. The new Acorn Media four-DVD set Northern Lights: The Complete Collection is quite a package, and contains literally everything they did, plus an intriguing 46-minute behind-the-scenes bonus feature. The series was produced from 2004-2008, and some called it a Britcom. I suppose that is as good a description as any. It certainly is funny, with some dramatic elements as well. The basic premise follows life-long friends/rivals Colin Armstrong (Robson Green) and Howard Scott (Mark Benton) as they live their unusual lives. Besides the original Christmas Lights movie, the set contains the Northern Lights series (six episodes), the follow-up City Lights series (six episodes), and the final Clash of the Santas movie. The two characters have been friendly rivals since they were children. As schoolboys, they clashed over soccer teams, girls, and clothes. Now in their thirties, the men compete over jobs, cars, Christmas decorations (! ), and plenty more. Surprisingly enough, their wives actually put up with all of the nonsense, but are none too pleased about it. The series was a big hit on BBC America, and is a nice addition to the Acorn Media line. They specialize in DVD sets of classic British television and movies for the U.S. market. Northern Lights: The Complete Collection is an excellent set, and (as usual with Acorn) priced very affordably. Well worth seeking out. Greg Barbrick has been watching TV so long he remembers watching first run episodes of Star Trek. Agatha Christie’s Poirot has steadily gained in popularity over time. An excellent piece of noir. I can say without trepidation that this Granada Television / ITV Network production is superb.